Hello everyone!! I seriously need to find more hours in my day or maybe more days in my week. But I have a feeling most of us feel this way. So much to do and so little time to get it all done! Anyway, as promised, I am back today with one more "batty" Halloween card. I wasn't planning on making two cards with the bat stamps but, while I was making yesterday's card another Halloween card with bats popped up in my Facebook feed - it was THIS one from my friend Justin's blog. He had embossed bats with black embossing powder on black cardstock. I had never thought of doing that and had to give it a go too! I started with an A2 top folding card base, adhered a piece of orange cardstock to the card front, and then distressed the edges with Black Soot Distress Ink. Next, I cut a piece of black cardstock with one of my stitched rectangle dies. 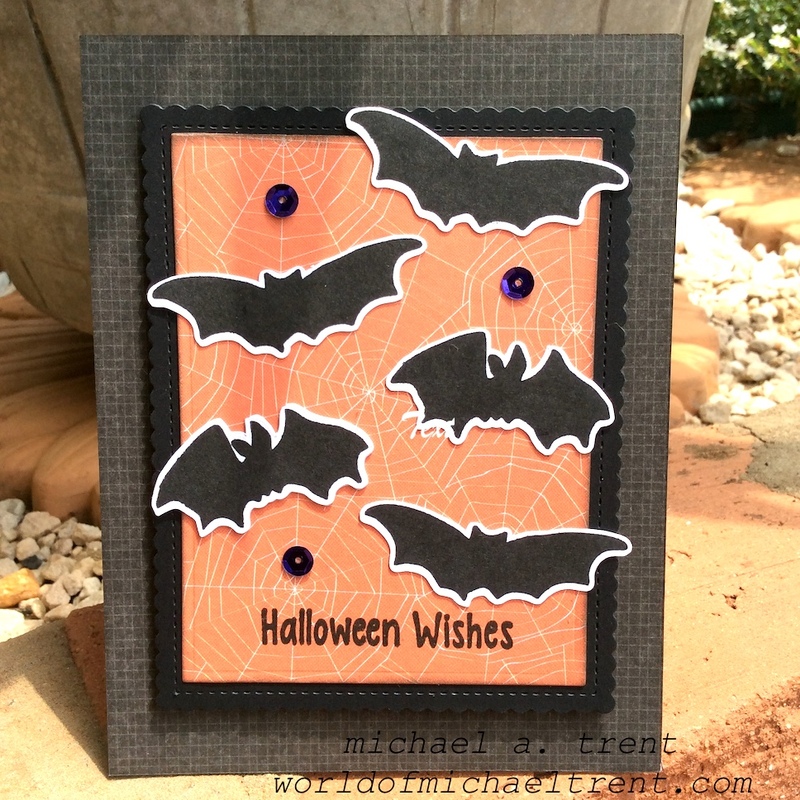 Then I stamped the bat image from my Halloween Wishes set several times using Versamark ink. Then I grabbed my heat gun, some Black Sparkle embossing powder by Ranger, and heat embossed the bats. LOVED how they came out! Once they cooled I adhered a piece of black fun foam to the back and then adhered this to the card front. Next, I stamped the two banner images from my Halloween set - the smaller one onto white cardstock and the larger one onto orange cardstock. Then I stamped the phrase from my Happy Halloween set on the smaller banner - all with Onyx Black Versafine ink. Once dry I cut the two banners out and adhered the smaller banner on top of the larger banner. I then put some pop dots on the back and adhered it to the card front. The last thing I did....because the card was calling for them...was to glue down some small googly eyes on each bat. Done! I really love how this card came out and it's a really quick card to make. Thanks Justin for the inspiration!! Let me know what you think of the card by leaving a comment below!! Hello everyone! It's been a crazy couple of weeks and I am very excited to announce that I have come out with a small line of Halloween stamps here in Brasil. Long story short....I was asked to give a charity class next weekend and they asked me for Halloween projects. I knew I could never get stamps here in time so I finally took one of those ideas in my head and made it a reality. My friend Francine here has a rubber stamp company called Scraplooving and I have always loved her images. So I tossed the idea out to her of me designing some Halloween images that she could make for the class (and to sell). She said let's run with this and before I knew it, I was sketching ideas, which is really not that easy for someone who is not an artist, and the next thing I knew....I had rubber stamps in my hands that I made! Crazy! I started by stamping the two bat images (from HERE and HERE) with Onyx Black Versafine ink onto white cardstock. Then had the Scan N Cut cut the images for me. Next, I went through my stash of papers and adhered this paper to my A2 card front. Next, I cut a piece of black cardstock using the largest die from the Nested Stitched Scallop Rectangle set and I also cut a piece of designer paper with the largest die from the Rectangle Frame set - both from Cottage Cutz. Then I stamped the phrase "Halloween Wishes" from THIS set using Onyx Black Versafine ink and adhered the designer paper to the black cardstock, which I then adhered to the card front. Next I adhered the bats around the front of the card, above the phrase. And the last thing I did...just to add a splash of color, was to adhere 3 purple sequins to the card front. Done! !